I solemnly pledge myself, in the Spirit of St. Nicholas, to maintain and advance my vocation as a conveyor of the true meaning of Christmas to all that I may meet in my journeys and travels. I will devote myself in bringing a loving loyalty to the Santa Claus Legend and will do all in my power to encourage the sentiment that it is truly better to give than to receive. I will use my knowledge and love for Christmas to be a part of the magic of the Season and to be partners with Santa Claus in bringing a Loving, Joyful, and Happy Holiday to all. I will seek to see the enchanting wonder of each new day and seek to see that wonder in each child’s eyes that I visit. I know that being Mrs. Santa Claus is a gift that I can give to children of all age and by undertaking this role I promise to create special memories, to the best of my abilities, for all that I shall encounter. 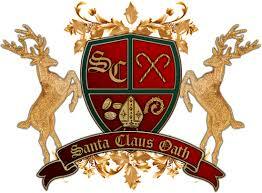 The Mrs. Santa Claus Pledge/Promise/Oath and other connotations are copyrighted under an attachment with Arcadia Publishing 2011 by Phillip L. Wenz. ISBN #978-0-7385-4149-5 and LCCC #2007925452 – All rights reserved.